Temperatures dipped well below minus 20 degrees Fahrenheit in Iowa on Wednesday (flickr). Early Wednesday morning, while many across Iowa were still asleep, records were broken by the so-called “Polar Vortex” over the Midwest. Before 4 a.m. Des Moines saw a minus 20 degree temperature, making it the coldest Jan. 30 the city has seen in recent history. Waterloo got an even colder minus 24 degrees, breaking the same record in that city. Farther north, temperatures reached minus 29 degrees, as reported by the Des Moines Register. Windchill made the cold temperatures feel even more brutal. In Cedar Rapids, windchill Wednesday morning reached minus 55 degrees, a tie with the 1985 record for the coldest windchill ever recorded there. According to the Register, winds were steadily between 15 and 25 mph, but at times blew into the mid-30s. Some studies suggest that such extreme “Polar Vortex” events in the Midwest could become more common with climate change, though more research needs to be done to make a definitive call on the matter. It appears that warmer arctic temperatures cause the jet stream, a westerly moving band of air circling the northern part of the globe, to dip farther south, bringing the North Pole’s extreme cold into the United States. Read this article from National Geographic for a more in-depth look at the science. This weeks segment looks at the affects of climate change on the Midwest covered in the Fourth National Climate Assessment. Increased heat and rain will strike Midwest agriculture from multiple directions. The Fourth National Climate Assessment, released in November, details the impacts of climate change for the Midwest. Productivity in the agriculture sector is a top concern. The Midwest has long sustained an ideal climate for growing crops, but projections forecast rising temperatures and more intense rainfall in the region, far from optimal for the healthy growth of corn and soy. Warmer winters will also encourage survival of pests season to season, and rising temperature and humidity in spring may increase disease outbreaks in crops. More intense rainfall will also increase soil runoff, already a major issue in the region. When soil washes off of fields and into waterways, there are fewer nutrients for plants in the field and more in the water, which can fuel harmful algae blooms. Scientists project a 5 to 25 percent drop in corn productivity throughout the Midwest by mid-century. Soy yields may fall about 25 percent in the southern Midwest, but could increase in northern states. Climate Assessment predicts water stress on multiple levels for U.S. This graphic from the Fourth National Climate Assessment shows groundwater depletion in U.S. aquifers a decade ago. Today, these underground water supplies are even more depleted. We already know climate change is having major impacts on rainfall. The 2018 Iowa Climate Statement said the strongest rainfall events of the year may double in intensity by 2025. Climate change will alter the hydrologic cycle in other ways as well, majorly changing society’s relationship with water. The Fourth National Climate Assessment, controversially released Black Friday, details the forecasted changes to water supplies in the U.S.. It compiles the findings of over 300 experts and has been reviewed by 13 federal agencies, in an effort to inform top decision-makers and common citizens. More intense rainfall will be met with more intense drought and reduced snowpack, which is bad news for communities that rely on glacial melt for their water supply. These changes are exacerbating water availability issues caused primarily by overuse of groundwater aquifers in much of the U.S..
As higher temperatures create even higher demand for water for drinking and irrigation, this problem will only get worse and worse, which will have major implications for both the food supply and the industrial sector. The altered hydrologic cycle will impact the quality of our limited quantity of water as well. Rising water temperatures will impact the health of ecosystems, and changes runoff patterns of pollutants into water will impact human health and pose challenges for water treatment facilities. Sea level rise could also threaten coastal drinking water supplies with the potential intrusion of saltwater flooding. 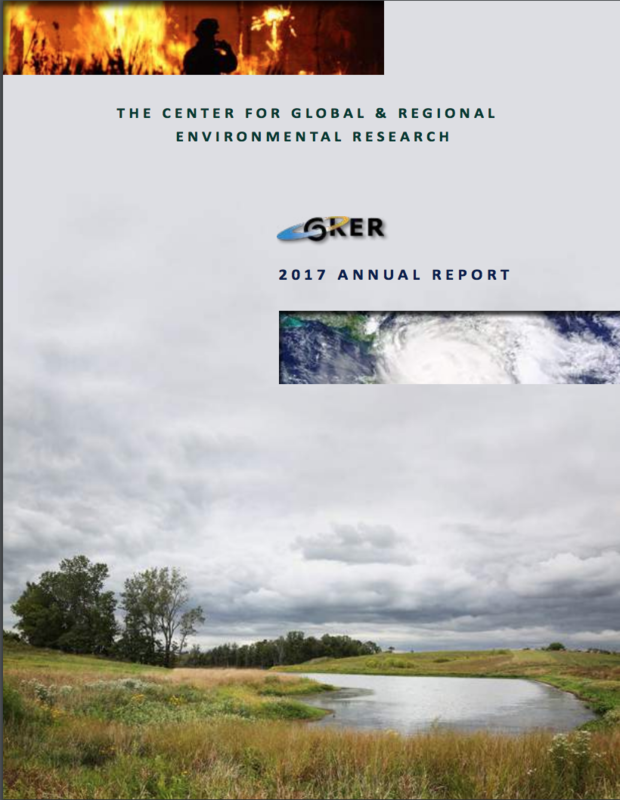 The report says the biggest water issues for the Midwest are adapting stormwater management systems and managing harmful algae blooms. Iowa is already familiar with floods produced by intense rainfall. Algae blooms, fueled by nutrient-runoff from farm fields, will be further increased by rising temperatures. Other water-related challenges detailed in the assessment include the deterioration of water infrastructure and managing water more strategically in the future. Green roofs are a type of green infrastructure (flickr). This week’s segment looks at flood mitigation approaches that incorporate nature into city design. As Iowa’s extreme rain events intensify over time, flood management considerations will need to expand beyond river floodplains. Floods commonly occur when rivers swell over their banks, but flooding can happen far from river systems, too. Urban flooding occurs when drainage systems fail to move large amounts of storm water away from developed areas quickly. 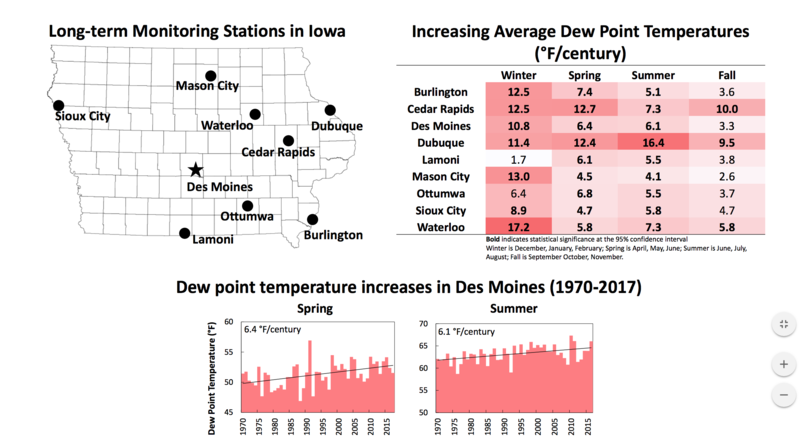 According to the Iowa Climate Statement 2018, scientists forecast that daily rainfall in Iowa’s most extreme rain events will double by midcentury, meaning cities and towns will have even more water to manage. One solution is to replace areas of impermeable concrete and asphalt with green infrastructure. These swaths of soil and vegetation absorb and slow down water to process it more naturally and reduce flooding. Green infrastructure can be incorporated into sidewalks, buildings, backyards and even parking lots. Rain gardens, bio-swales, green roofs and more bring plants, soil and mulch into community design in attractive and helpful ways. The buildings of Houston made the floods it experienced last August more intense, a new study found (flickr). Houston can partially blame the unprecedented flooding it experienced during Hurricane Harvey last year on its skyline. A new study co-authored by Gabriele Villarini, associate professor of civil and environmental engineering and director of IIHR-Hydroscience and Engineering at the University of Iowa, found that Houston’s topography exacerbated Harvey’s rainfall. Researchers obtained data on rainfall and water discharge in Houston during the storm from various national agencies, and compared it to a computer model that simulated the same storm with a twist. In the model, the city of Houston was replaced with undeveloped farm fields to calculate the built environment’s effect on the storm’s behavior. The analysis concluded that urban development in the Houston area increased the likelihood of intense fooding 21 times during that particular storm. In other words, if Houston were really an expanse of farmland instead of a city, less rain would have fallen. Vecchi said when tall buildings push air farther upwards, the amount of atmospheric water vapor that condenses into rain increases. Houston’s skyline not only stalled the storm, but squeezed more rain out of it.